Mullumbimby Gets a Reprieve from the Woolly Mammoth!!!!!! 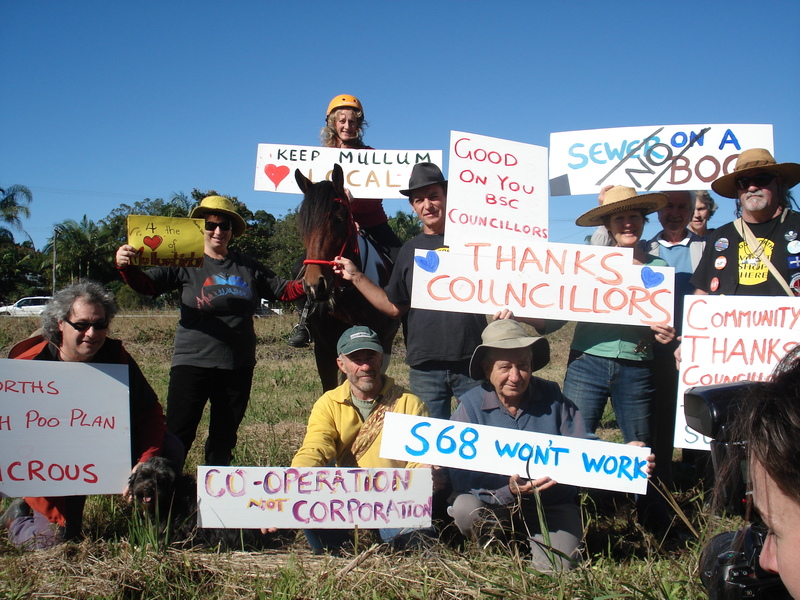 Hoorah for Byron Shire Councillors who voted yesterday to send the Woolworths sewage application back to the drawing board. Moved by Cr. Tom Tabart, 6 out of 9 of our elected representatives have demanded that council staff answer 12 specific questions about the adequacy of the Woolworths sewer-on-a-bog. In doing this, councillors have effectively delayed Woolworths construction of their massive supermarket in Station Street. This delay might even be until the new STP (sewage treatment plant) is built, as we do not believe that the sewage application meets the local, national and state standards, guidelines and policies. The supermarket was approved by the Department of Planning on 12 January this year, but construction could not go ahead until Byron Shire Council approved their on-site sewage (s68) application – which they have not done!!! 1. To follow the Precautionary Principle and vote "no" (this is what BSC recommended). By giving an alternative option, BSC implied that the Precautionary Principle is disposable. 2. To follow a "pragmatic risk-based approach" and vote "yes" to the s68 as long as Woolworths adopt the "draft consent conditions" annex 31(f). Notice the language: "pragmatic" sounds so practical, and "risk-based" sounds exciting. In fact the option is very unpragmatic and very risky. The Consent Conditions are tough and Woolworths would have to jump through hoops as well as move the water mains from under the site, at their own expense. The only problem with having tough consent conditions is – who will be watching if Woolworths breaks their consent conditions? If councillors had voted "no" then Woolworths would have gone to the Land and Environment Court. All they would have to do is show the judge the "Consent Conditions" which are a list of what Woolworths need to do, authorized by staff at Byron Shire Council, to get an approval for their on-site sewer-on-a-bog. Therefore both a "no" and a "yes" vote would have been a win for Wws. However, our smart MCAN wastewater experts smelled the rat. Garry and Duncan, in conjunction with Tom Tabart formulated 12 questions for council staff and Woolworths which demand to know how the s68 sewer-on-a-bog meets the standards/policies/guidelines of the local/state/national government. Tom put forward a motion to have these questions answered before councillors commit themselves to approving (or otherwise) Woolworths sewage application. We are confident that these questions cannot be answered (we will get them up on our website soon) so it may well be that the Woolworths development will not go ahead until the new sewage treatment plant (STP) is built, and that could be some years away. However, they are a wily bunch and goodness knows what they"ll come up with in the meantime. Besides Tom, Basil Cameron seconded the motion and the other supporting councillors were Mayor Jan Barham, Richard Staples, Simon Richardson and Patrick Morrisey. Tom gave a lovely metaphor for the Woolworths sewage proposal; for it to work they would need "goat entrails and a PhD in Astrology". Jan spoke passionately about the influx of corporations into the Shire which we"ve worked hard to preserve, as well as expressing distress at the way local councils are being overridden by corporations and State Government; Basil said that asking the 12 questions was a "sensible solution which is the nuts and bolts of this proposal"; Simon described the options offered by staff as being like "being given a bucket with holes in it and being told to put out a fire. We will get burnt". He also mentioned there are cultural, environmental and social implications of having a Wws in Mullumbimby. Richard referred to the "silver bullet" product Wws propose that will supposedly clean/sanitise and not upset the microbes needed for the septic system saying that it would most likely contain large amounts of sodium, also detrimental to soil. 1. Do the draft conditions meet or exceed all relevant regulations and guidelines including Local, State and National Standards, Guidelines and Policies? 2. Are the draft conditions likely to satisfy Clause 45 of the Byron LEP? installed or constructed and other land in the vicinity of that land. 1.5m (or more where a water-table is indicated or encountered)? such compromises will fully protect the environment and public health? such a compromise will fully protect the environment and public health? details the skills and hours per year of the on-site and off-site operator(s) of the OSMS? short-term and long-term on failure of the OSMS? health of customers and staff at the supermarket?